This past summer I was blessed with a beautiful baby girl we call Heléna. All my friends and anyone who peruses through my blog knows that I love travel. So the big question was how will baby impact Cultured Americana travel? This is a question I pondered throughout my whole pregnancy and I still wonder. I decided I'd take baby steps. Heléna is almost 4 months old. She spent her 1st month of life in the NICU as she was 6 weeks premature and 3 pounds when she was born. She spent most of the second month of her life at home since she was still so itty bitty. Around half way through the second month, I decided that I needed to carefully introduce my lifestyle to my little one. We started doing weekly day trips around the Bay Area. With all the hoopla of getting used to having a baby with me, I didn't really take good photographs on those day trips. If I had, I would have included them in this blog as they were fantastic collected experiences. I say all that to say those day trips were preparation for Heléna's first road trip affectionally known as H.R.H (Her Royal Highness') First Southern California Tour. Whew! The amazing thing is, we actually did not overpack! We used everything listed above. Now I will admit I did pack about 10 outfits for Heléna for a 4 day trip but I wanted to ensure H.R.H had options AND she is a baby so who knows what could happen regarding her wardrobe! Twinnin' for our first road trip! Chucks for all! The drive from Walnut Creek, CA to Long Beach took about 9 hours since we made several stops to feed ourselves and feed and change the baby. We rented a beach cottage via homeway.com in the Belmont Shore area of Long Beach, CA. I have been wanting to do a beach vacay for awhile and Long Beach is close to my family so it seemed like a good option. It worked out really well! Our 1920's beach cottage was adorable, comfortable and a stones throw away from Long Beach City Beach. Every morning I enjoyed walking my daughter and the dogs on the beach (there was even a dog beach). After our walk, my daughter and I would drop off the dogs at the cottage and then walk down to the local Peet's Coffee to pick up breakfast. One reason I love renting homes as opposed to getting a hotel when I travel is it allows me to borrow another lifestyle and try it on for size. Beach living is fantastic! What was on the itinerary? This was a family trip. If you have read my other post you will note that I usually travel solo and do a lot of ripping and running around. This was a different type of trip which is fitting because my life is very different than it was 6 months ago. The main purpose of this excursion was for some of my SoCal friends and family to meet my daughter. As such, we received visitors at the beach cottage and visited people as well in different parts of Southern California. One highlight outside of visiting with loved ones was taking Heléna to her first pumpkin patch. Of course she won't remember it but she will always have the pictures to look back on. The carseat situation was a little tricky. It would have been straightforward if I had taken my own car. Initially, I rented a carseat with my rental car. The purpose of my doing that was to ensure the carseat was installed properly. Well, apparently I didn't read the fine print because the car rental company does not install the carseat. They leave that fun task to the renter to avoid liability. The carseat they gave me looked like it was from 1982 and I didn't want my baby anywhere near it. Since the carseat looked horrible and they didn't install it anyway, I returned it and opted to take my own. The only problem was, I didn't want to remove my base from my car since it was installed and inspected by CHP before we brought my daughter home. Therefore, I opted to use the carseat without the base and took it to be inspected by AAA. This sounds easier than it is. AAA cut me a break as you must have an appointment for inspections from AAA, CHP or anyone that I know of that does carseat inspections. The AAA guy confirmed that I installed the carseat correctly but advised me on the benefits of having the base since it ensures the carseat is always installed correctly. I took that advice and decided to buy another base on our way down to Long Beach. Once we settled in Long Beach my mother called around to try to secure an inspection for us and we got the run around. Therefore, I installed the new base and felt pretty confident since AAA had explained it to me and I followed the instructions carefully, This all was a hassle and a learning experience. Since I love traveling I am working on some ideas to make this aspect of traveling with infants less of an issue. My daughter is an excellent road-tripper! Stay tuned as I think our first plane trip will occur in the next few months and after that Cultured Americana and Baby are going international. My goal is for H.R.H to have her first passport stamp by her first birthday! The best way to experience a culture is to experience it through the food. As such, most of my trips include several culinary adventures. Spain was a fantastic place for sumptuous wines and tantalizing delectables! It wasn't intentional but for my trip to Spain, I participated in a lot of small group tours. Small group tours are usually groups of about 6-8 people at most and it is fantastic, I noticed you get a more personalized intimate experience through small group tours and there is this feeling of exclusivity that come with these types of experiences. I was happily the 5th wheel on a small group food and wine tour. On this tour we experienced a sumptuous breakfast at the base of Montserrat. After breakfast we drove up to Montserrat ( I was actually lucky enough to go to Montserrat twice during my stay in Spain) to explore, drove down to the other side of the mountain where we had a fantastic lunch and then finished the tour with a wine tasting Parés Balta vineyard/winery. Moral of the story here is when you travel and you have an opportunity to take a food tour......DO IT! It is always a great time and gives you an opportunity to really immerse yourself in the culture. Cultured Americana Tip: It's always fun to extend your travels as much as possible. As such, when I go wine tasting during my journeys I always have wine shipped back home. I will admit that this is expensive but such a worthwhile treat. My tradition is to share the wine I've tasted with my guests at Thanksgiving dinner. I ordered several bottles of the wine from he Parés Balta tour. The wine arrived just in time for Thanksgiving. I was looking forward to it and found out I was pregnant! :-) No wine for me!!!! Onward to find the world's best chocolate cake! Next Stop Bubo. Somewhere along the way I learned that the award for best chocolate cake belonged to a bakery in the El Born district of Barcelona. Of course, I couldn't say I experienced Barcelona without collecting that chocolate cake eating experience. I continued my culinary expedition by taking a paella making class with a lovely woman named Marta who teaches the classes in her lovely apartment. I found Marta's class through eatwith.com. It was great being welcomed into a local's home. Cooking classes are another wonderful way to immerse oneself in a country's culture and come home with a new skill. Although I travel to meet locals, cooking classes also give me an opportunity to meet fellow travelers which is also fun. I was so glad I took the paella making class because I wanted paella my whole time in Barcelona but I couldn't get it at restaurants since the minimum serving was for two. By taking a cooking class I had an opportunity to learn how to make paella and had a group of people to share the experience with. The lovely Ms. Marta putting the finishing touches on the paella! Last stop in my search for culinary delights was La Boqueria. Mercat de Sant Josep de la Boqueria is a large public market. I have been to public markets of course but this was like nothing I had ever seen. It was so big, beautiful and colorful. Marta from the paella cooking class suggested we buy saffron and paprika as souvenirs so that is exactly what I did. Now I have a taste of La Boqueria when I make egg, chicken and countless other meals I make at home. Barcelona and the surrounding areas were such a amazing culinary escapade! Buen provecho. Enjoy your meal! Welcome to the first of hopefully a few post on my amazing trip to Spain last Fall. Soon after returning from Spain I became pregnant with my first child. With all the hoopla and "infanticipation", I let my beloved blog fall by the waste side......temporarily. As I type, I am in the room with a beautiful sleeping 12 week old princess we call Heléna and I've decided to take this stolen moment to continue to share my collected experiences. Better late than never! I have so much to share with you all. As you may know, I am a huge proponent of solo traveling! I traveled to Spain solo but I will admit the biggest downfall of traveling by oneself is you don't have many pictures that capture you experiencing the magical moments of your journey. You either end up with selfies or awkward pictures taken by other tourist or locals. Hey beggers can't be choosers! While preparing for my trip to Spain I fantasized of being Beyoncé and having a photographer travel with me to help me document my adventure. I thought "there should be some type of photoshoot tour!" Well, there is! 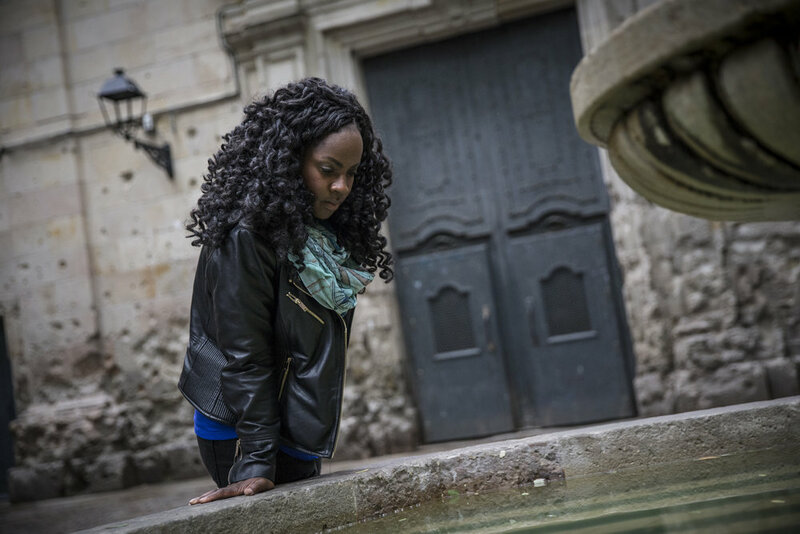 Enter Photoshoot tours in Barcelona! Photoshoot Tours is an amazing company that offers tours of neighborhoods in Barcelona combined with an amazing photoshoot. 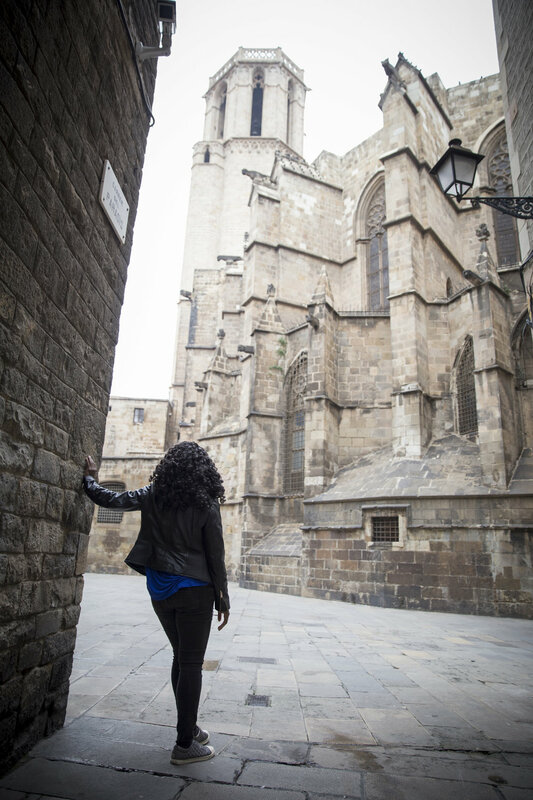 Neighborhoods toured are the Gothic Quarter, El Born, and Park Güel. I chose the fantastic Gothic Quarter which is part of the old city and therefore full of rich, vibrant history, On the tours travelers have an opportunity to learn about a neighborhood or two and have their adventures captured and memorialized forever! The tours are a favorite of honeymooners and families but I highly suggest it for solo travelers. There is something so cosmopolitan about having a private tour guide/professional photographer accompany you for a few hours during your travels. Enjoy a few shots from my fantastic photoshoot tour! Cost: Starting at 100 euros. I got the 100 euro package which included a 2 hour tour and over 70 pictures. I consider it a steal! I have no idea who this guy is! During my photoshoot a local decided to join me for a shot so I went with the flow! Another collected experience!! I had an amazing time during my maternity photoshoot with Sara Jennings Photography. 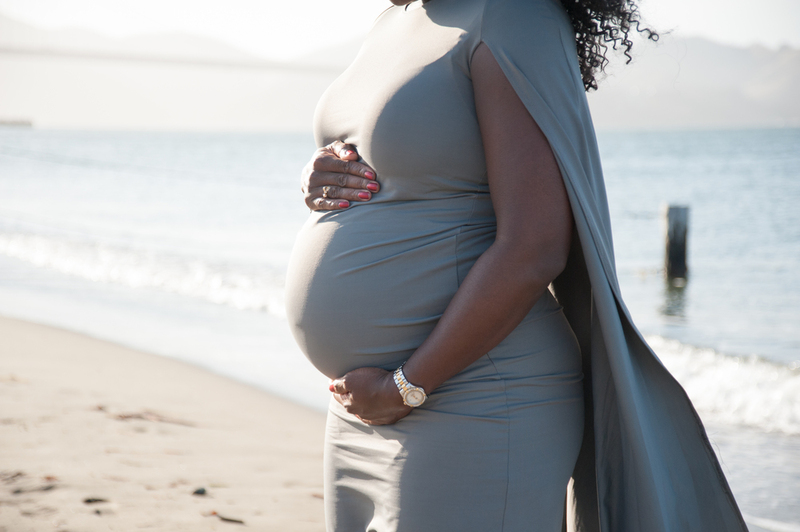 My goal was to have the iconic Golden Gate Bridge co-star with my beautiful baby bump! We shot on a spectacular, windy San Francisco evening at Crissy Field. It was a lovely day to be photographed with the Bridge as it was the GG Bridge's 79th anniversary. I had the dress made for me by LysaBo. Find her shop on Etsy! Here are a few shots in this special place which captured this special time in my life. Can't wait for my Little One to see these photos!. The Beach and my beautiful Belly!! !